devouring comics for terrifyingly close to thirty years now, and I grew up being teased with really amazing cover art pitting two overmuscular superhero types against each other -- Clash of the titans! The one you've been waiting for! -- only to flip open the book and see the brawl limp to a close in the space of a page and a half. There's nothing like that in Marvel's latest direct-to-Blu-ray animated release; Hulk vs. completely lives up to its title. There are no long, tedious origin stories. Neither half of this double feature is bogged down by any meandering, who-really-cares filler subplots, clunky romances, or triple-underlined moral messages. These two mini-movies chuck viewers straight into the action and never let up until the end credits roll. Marvel and Lionsgate haven't watered it down to play to the lunchbox crowd either; these battles against Thor and Wolverine are intense and unflinchingly violent, to the point where I'm kind of surprised it slinked by with just a PG-13 rating. As a nod to the comics that first introduced Wolverine to the world, he and the Hulk square off in -- where else? -- the desolate Canadian wilderness. The Hulk has been carving a path of destruction throughout the Great White North, and Department H drops Wolverine in to stop the beast dead in his tracks. The two are fairly evenly matched: Wolverine's healing factor can take all of the abuse the Hulk can dish out -- flinging him what looks like miles away, smashing his hairy little body into the ground over and over again with a three-ton rock -- and although those adamantium claws sink deep into the jade giant's hide, all it really seems to do is piss the Hulk off even more. Just as the tide starts to turn in this brutal, bloody brawl, the Hulk's back is peppered with a stream of oversized tranquilizer darts. The Weapon X program sees the Hulk as the ultimate weapon in its arsenal, and as the sleeping giant is being prepped for a mindwipe, Wolverine escapes and slices through the small army of seasoned killers that stand in his way. 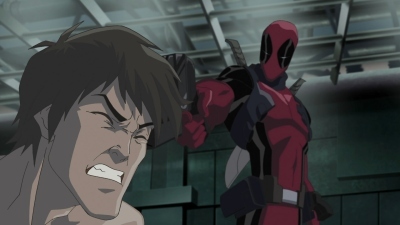 Deadpool a nod. This is the most perfect take on the Merc with a Mouth I could've ever hoped to see, both hysterically funny and deeply psychotic. The title Hulk vs. Thor doesn't really convey the scale of the second half of this double feature. The Hulk isn't just pitted against the Norse god of thunder; he singlehandedly takes on the entirety of Asgard: the Warriors 3, legions of valkyries, frost giants, Odin's ravens, Hel itself, and virtually every last iconic character from the pages of the comics. The movie is set in the waning hours of the Odinsleep: the annual slumber of Asgard's greatest protector that leaves the realm most exposed to assault from its enemies. Every plot, scheme, and army to have ever been unleashed during the Odinsleep has been handily defeated over the years, but the warriors of Asgard have never been pitted against a force as unstoppable -- the embodiment of rage -- as the Hulk. An embittered Enchantress uses her dark sorcery to bring the Hulk under Loki's thrall, and the god of mischief pulls the beast's strings to effortlessly pummel his brother Thor to within inches of death: no small feat for an immortal god. The Hulk's thundering rage proves too difficult for Loki to control for long, though, and with his ferocity fully unleashed as never before, he's not going to stop until the entirety of Asgard lays in ruin. It's as if the writers behind Hulk vs. Thor couldn't figure out what Asgardian lore to mine from the hundreds of issues of the comic, so they opted to throw in everything. Virtually every recognizable character and iconic image from the greatest of the Nine Worlds is featured here at some point. Its story is more involved than Hulk vs. Wolverine and is given a few extra minutes to breathe, but the action never lets up here either. Dark magicks rend Bruce Banner from the Hulk, removing the lone spark of humanity keeping the beast's colossal rage in check, and his path of destruction is unreal, even threatening to topple Hel itself. The imagery isn't nearly as graphic as Hulk vs. Wolverine, but there's still an enormous amount of carnage, and the sight of Thor's arm being shattered or the god of thunder laying limp and lifeless after being punched clean through a mountain is still remarkably intense. I have to admit to not being quite as dazzled by Hulk vs. Thor as I was with the first half of this double feature; dialogue like "You are no troll, monster!" doesn't sound quite as effortless, the voice acting is perfectly fine but more straightforwardly proper and British, and the celebratory ending seems a little forced. Still, its ability to draw so deeply from some four hundred issues of Thor ought to astonish even casual fans of the comic, the scope of the movie is truly epic, and the torment and anguish inflicted on Bruce Banner pack about as much of a wallop as a roundhouse from the Hulk. frothing-at-the-mouth fanboys. There's no filler or tedious origin stories here: both halves of this double feature dive headfirst into the action, with Hulk vs. Wolverine pitting its two title characters against one another before the counter can even tick its way to the one minute mark. The backstory is unveiled quickly and efficiently -- and frequently through imagery on-screen rather than clunky exposition -- to keep from getting in the way of the action. Both movies really live up to the promise of their titles too, and virtually every last moment is some sort of brutal, massively destructive, and visceral battle royale. The Hulk wreaks an indescribable amount of havoc throughout these two flicks, and they're both teeming with death and destruction. 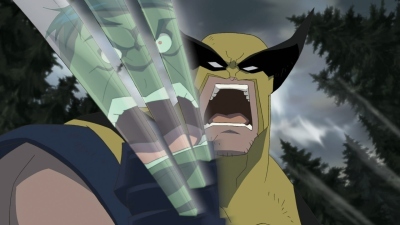 Hulk vs. isn't one to grab off the shelf for a nine year old just getting into comics; these two movies are jaw-droppingly violent, with Hulk vs. Wolverine alone featuring five scenes with limbs being carved apart and torn off. This isn't G.I. Joe where everyone manages to mash the Eject button before their planes explode. There are stacks of dead bodies littered throughout both movies, and its walls are slathered with blood. Even an immortal like Thor is savagely pummeled to the brink of death, and Wolverine's claws draw blood through the Hulk's thick green hide over and over again. At one point, Wolverine slices throughout an arm that goes flying, and a stray filet -- a perfectly round slice of bicep -- rolls gingerly towards the camera before tumbling to its side, as if a tuna roll had spilled off a plate and onto the floor. 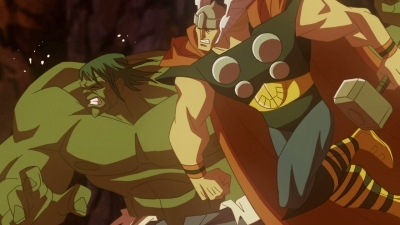 There were a couple of points where I actually shouted in complete disbelief at just how deliriously violent Hulk vs. really is, and this double feature is the first of these Marvel animated movies to catch me anywhere close to off-guard like that. This double feature in total may be the length of a traditional Marvel release, but these are two distinct movies with very distinct styles. Even the Hulk looks completely different from one movie to the next, reflecting the shift from the more recognizable beast who just wants to be left alone in Hulk vs. Wolverine to rage incarnate as he ravages Asgard. The designs throughout Hulk vs. Thor are sleek and elegant, relying more on crisp and very fine linework, while the half with Wolverine is skewed in a more exaggerated but wildly effective direction. The quality of the animation feels like a step up from previous Marvel direct-to-DVD ventures -- its sheer ferocity has really brought out the best in these animators -- and both movies look incredible. The only character design across the double feature that I don't think quite works is Sabretooth. The rest of the lot in Hulk vs. Wolverine are exaggerated and stylized, but he comes across as a little too Saturday morning. Still, take a scene as absolutely dazzling as Wolverine draped in shadow as he carves apart a dozen heavily armed mercenaries, and any complaint seems like nitpicking. This is the Marvel animated movie I've been waiting for. It's not pandering towards a younger crowd or trying to weave a long, bland origin story to draw in teenagers and twentysomethings who haven't flipped open a comic book since fifth grade. Both halves of the double feature are intense, visceral love letters scrawled in blood to these characters: unrelenting waves of destruction written and animated with a clear passion for the comics. Hulk vs. is absolutely essential viewing for longtime fans of any of these characters. Highly Recommended. 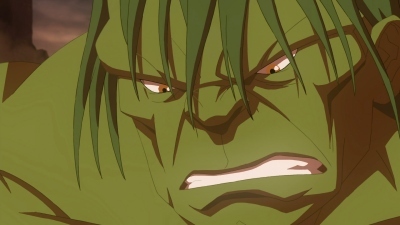 Hulk vs. is the best looking of Marvel's direct-to-video flicks yet, boasting stronger character designs than the rest of the lot along with animation that's more fluid and nuanced. The linework is exceptionally crisp on Blu-ray -- there's no mistaking this for a standard definition DVD -- especially the very fine lines used throughout the more elegantly designed Hulk vs. Thor. The textures of the painted backdrops also look terrific in high definition. Black levels are consistently deep and inky throughout, and there's a rock solid sense of contrast. Each movie has its own distinct palette, and although the hues are by design subdued a bit -- colder and more frigid in Hulk vs. Wolverine and filtered through a golden sunset in Hulk vs. Thor -- they're still strikingly saturated. Really, the only flaw I could really spot is some occasional banding, but even that's infrequent and generally limited to a small chunk of the frame. This is addressed in one of the commentaries as well, actually, so it looks to be an issue with the way these two movies were mastered rather than a hiccup with the authoring of this Blu-ray disc. Hulk vs. looks pretty spectacular in 1080p, and I don't have any meaningful gripes about this high definition presentation at all. This double feature fits comfortably on a single layer Blu-ray disc. Both movies are presented at an aspect ratio of 1.78:1 and have been encoded with AVC. Hulk vs. Thor and Hulk vs. Wolverine both sport 7.1 DTS-HD Master Audio soundtracks. The clarity and distinctness of every last element in the mix can be startling, even something as subtle as the metallic clink of spent shells tumbling to the ground when Wolverine kicks aside some debris. The low-end is unrelenting: the meaty thuds of all of these punches, bodies thrown at a couple hundred miles per hour straight into trees, mountains, and reinforced walls, and the Hulk ripping the netherworld apart with his bare hands. Even the jade giant's half-growl as he inhales coaxes a low-frequency assault from the subwoofer. For a movie so fixated on destruction, the mix does seem to be weighted much more heavily towards the front channels than I would've expected. The rears aren't ignored, nicely reinforcing the score and such effects as the clatter of hooves in battle, but the sense of immersion I'd hope to hear in this sort of movie really isn't there. Maybe it has something to do with the downmixing of the 7.1 audio to my 5.1 rig, but I'm skeptical that's to blame. Even though its lossless soundtrack favors the front speakers, both movies sound incredible, from the fidelity of the recording to some truly outstanding voicework to the cacklingly depraved sound of adamantium claws piercing armor, flesh, and bone. Also included is a Dolby Digital 5.1 dub in Spanish. Subtitles are offered in English (traditional and SDH) and Spanish. Both halves of this double feature are bolstered by a pretty decent selection of extras, and every last one of them is presented in 1080i. Audio Commentaries: There are four commentary tracks spread across this double feature, two of which feature Craig Kyle and Chris Yost. 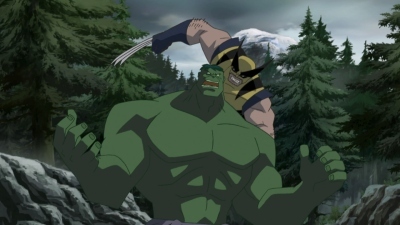 Their track for Hulk vs. Wolverine is kind of disposable -- they succumb to their inner fanboys and spend the better part of a half hour talking about just how awesome the flick is -- and most of the best notes are highlighted in its other commentary. The two of them have quite a bit more to say about Hulk vs. Thor, though. It's a really quippy track that occasionally pokes fun at the movie, and some of the highlights include just how far removed this half of the double feature is from Hulk vs. Wolverine, cramming in virtually every last recognizable feature of Asgard into the film, and losing a (literally) deus ex machina ending that wouldn't have been nearly as satisfying as what made it into the film proper. tight production schedule wound up being kind of a plus. Paur's commentary for Hulk vs. Thor features director Sam Liu and colorist James Peters, and it's a strong balance of notes about the unconventional storytelling, its stylized visuals, and the many nods to the work of Walt Simonson, Jack Kirby, and John Buscema in its designs. Making-of Featurettes (38 min. ; HD): Hulk vs. Wolverine and Hulk vs. Thor each have a set of extras delving into how these movies came together, from assembling their stories to recording the voicework. "This is Gonna Hurt: The Making of Hulk vs. Wolverine" (20 min.) places its emphasis more on the look of the movie -- Jeff Matsuda's intensely stylized character designs and paying homage to the most iconic moments from the Hulk and Wolverine's many four-color clashes -- while Hulk vs. Thor's "Of Gods and Monsters" (18 min.) is anchored primarily around the voice actors. Jack Kirby and Thor (5 min. ; HD): This featurette briefly explores how the strength, power, and nobility of Jack Kirby's artwork filtered into Hulk vs. Thor, but really, its chief appeal is a parade of dazzlingly high-res scans of some of the King's best work on the Norse god. Fan Frenzy (8 min. ; partially HD): Hulk vs. Wolverine was previewed at the 2008 Comic-Con in San Diego, and the Q&A that followed has been cut together for this Blu-ray disc. The questions are kind of cursory, but it's worth a look, touching on the stylized character designs and whether or not there'll be another volume further down the line. While the video is technically in 1080i, very little of it is actually in high-def; the panel footage was shot on really low-grade DV. First Looks (11 min. ; HD): Lengthy previews of the Wolverine and the X-Men animated TV series and the direct-to-DVD prequel Thor: Tales of Asgard have also been included. 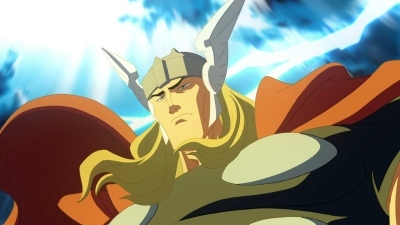 Thor is early enough along that there's very little animation to showcase, but there is a fair amount of footage from Wolverine..., even if it does look kind of squashed. These First Looks are driven more by comments from the writers and producers than actual animation, but as teasers, they're more than strong enough to pique my interest. Trailers (HD): Plugs for a couple of video games, Disaster Movie (ugh), and seemingly every single one of Marvel's animated titles round out the extras. Hulk vs. comes packaged in a traditional Blu-ray case and is tucked inside a glossy cardboard slipcase. This brutal and unrelenting double feature is the first of Marvel's direct-to-DVD movies to be aimed squarely at longtime readers of the comics, and it's by far the best of their animated titles to date. 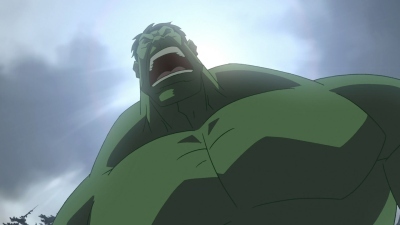 Hulk vs. looks and sounds incredible on Blu-ray too, rounded out by a slew of commentaries and high definition extras. It's not for the younger crowd, no -- I'm really not sure how something as graphic as Hulk vs. Wolverine managed to sidestep an R-rating -- but for seasoned Marvel fans, Hulk vs. is the first of these movies I'd point to as essential viewing. Very Highly Recommended.